On Wednesday 24th October 2018 Prof. Dr. med. Edgar Voltmer gave a presentation concerning “Keen on power in times of burnout?!”. This event was part of the event series “One University – One Book”. What is burnout? How does it occur? How do you feel when you are affected? Is this a fad? Can everybody get it or is there a vaccine against it?! 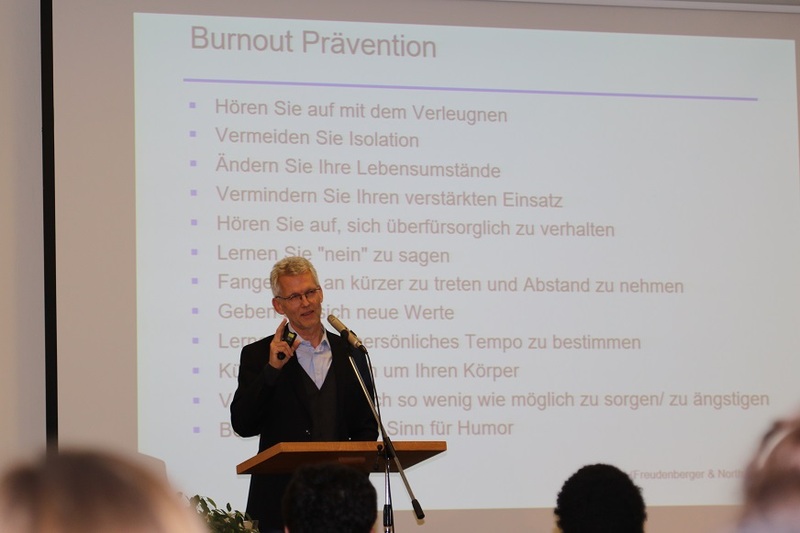 Burnout – according to German Duden – its not only a socio-medical, but a technical term. In technic it means “blowing out of fuel elements at overheating”. This Definition illustrates what happens to humans when they are affected and how they feel, when they come down with burnout, which is a serious matter. After the diagnosis and the loss of the fitness for work, the affected person often gets a mostly long- term sick note and a crave for delimitation and withdrawal from social and active life. It is very difficult for the sufferer; employers and costs arise for society. What can be done, when one feels an overload of things and if resting isn’t enough to overcome the permanent exhaustion? Is it the quadrature of circles: working harder and more in less time to achieve efficiency and be quicker and active? What do solutions and ways out look like? These and other questions where mentioned by the speaker. His specific advices are: Change your living conditions, minimize your amplified use, stop being overprotective, learn to say no; start taking things easier and refrain, create new values, learn to establish your own speed; care for your body, try to be less anxious and afraid, keep your humour! The speaker quoted the essay “Müdigkeitsgesellschaft” by Byung-Chul Han during his presentation. Prof. Voltmer is a proven expert on this topic. He graduated with his thesis “Psychological Burdens and approaches to job-specific prevention and health promotion”, is a systematic family therapist and teacher for health science at Friedensau Adventist University.